Despite his status as Hollywood royalty, Spike Lee has never been one of our favourite directors. That’s not to say he hasn’t done films we’ve enjoyed — Clockers, He Got Game and Inside Man to name a few — but seeing his name associated with a project doesn’t automatically mean we’re going to see it. That being said, his latest “joint,” Blackkklansman, based on the true story of an African-American officer infiltrating the KKK, most definitely piqued our interest. In the 1970s the city of Colorado Springs was looking to integrate its police force by hiring its first black officer. That would end up being Ron Stallworth (John David Washington), who after a brief turn in the records department is transferred and sent undercover to observe a speech from civil rights activist Kwame Ture. His job being to assess whether or not the city should be concerned about a possible uprising. While still new to the department, Ron calls regarding an ad for the KKK, inadvertently leaving his real name. When they call back and want to meet, Ron must team up with a white officer to play him in person. Flip Zimmerman (Adam Driver) gets the assignment and after some initial suspicion he’s invited to formally join the Klan. As the operation bears fruit, Ron and Flip continue to portray the same person with Ron on the phone, even talking with Grand Wizard David Duke (Topher Grace), and Flip in the trenches. Some among the KKK don’t fully trust their new brother, however, most notably Felix (Jasper Paakkonen), who seeks to be the chapter’s leader and utilize a more violent approach, making things more dangerous for all involved. Blackkklansman is a very well-acted film, and that starts at the top. Driver has already had some strong performances in the past, but the emergence of Washington, whose most notable role is as enigmatic NFL receiver Ricky Jerret on Ballers, is critical to the movie’s success. He gives a layered performance as both a cop doing his job and a black man concerned about his people’s struggle for equal treatment. There’s a good mix of dramatic elements and comedy, and Lee does solid work in maintaining the seriousness of the people and organizations involved while still injecting levity. It might’ve been tempting to portray the Klan members as buffoons and/or one-dimensional bigots, but they run the gamut, and the use of Felix’s wife Connie, who’s both perfectly cheerful and violently racist, really rounds out the characters. At the core of Blackkklansman is an interesting story, one that managed to hold our attention from start to finish with very few exceptions — Stallworth’s romance with Patrice, the president of the local university’s black student union, feels fabricated to give him more personal stakes in the investigation and we never warmed to the character with her relentless anti-cop stance. As noted, we didn’t like Patrice’s character. Relative to most of the other principles she only seemed to have one note to play. The same could be said of Paul Walter Hauser, who got the nod of the obligatory overweight and unapologetically stupid racist that always seems to find his way into any film on the subject — Ethan Suplee probably pulled it off the best in American History X. Based on a true story doesn’t mean it’s a true story, and Lee doubtless took some liberties with the events surrounding the Stallworth infiltration to make it more entertaining. That’s fine, but it gets a little too “Hollywood” in the film’s final scenes when so many levels of coincidence and happenstance converge for a feel-good moment. Considering there’s a legitimate back story to the film’s events, having less than 10 minutes of extras is poor form. An extended trailer (of the movie you just watched) set to new music is one featurette, while a brief catch all about making the film is the other. Granted, a lot of time bonus features feel like complete fluff, but there was subject matter here to be discussed. 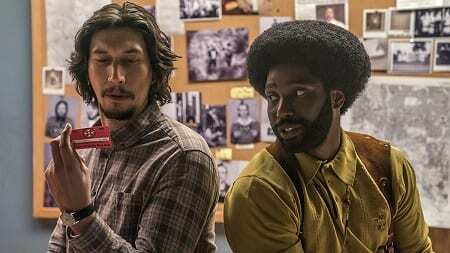 We generally enjoyed Blackkklansman, due to in no small part to strong performances at the top from Adam Driver and John David Washington. While some will no doubt take issue with some of the subtle (and not so subtle) political tie-ins we just brushed them aside and focused on enjoying the actual movie. This entry was posted on Friday, November 9th, 2018 at 9:40 pm	and is filed under Herija Green, Movie Reviews. You can follow any responses to this entry through the RSS 2.0 feed. Both comments and pings are currently closed.